The appliance you have been given is cemented. When the expander is first inserted, you may talk differently and you may produce extra saliva because your brain thinks the appliance is food. It also may be difficult to swallow at first. Just be patient and within a few days these problems will disappear. Unless Dr. Baumwoll gives you different instructions, you will be turning the expansion screw once a day for a specified number of days by placing the long blue key in the expansion screw and turning it by following the direction of the arrow. If you have trouble turning the key, please call our office. You may notice a small space developing between your two front teeth. This is normal and means the appliance is doing what it is supposed to be doing, making your upper jaw wider. Brushing and flossing your teeth can be challenging when wearing an expander but it’s extremely important. If you cannot brush after every meal, rinse well with water. Special brushes such as a proxy brush can be used for hard to clean places. The retainers you have been given are removable. For the first two months, only remove them when eating, brushing your teeth, or playing an active sport or swimming. Otherwise, they must be in your mouth AT ALL TIMES! After two months, wear your retainers just at night while you are sleeping. Do not miss a night! When the retainers are first inserted, you may talk differently and you may produce extra saliva because your brain thinks the retainers are food. Just be patient and wear them faithfully. Within a few days these problems will disappear. Since they can be easily lost or broken, your retainers must be in the retainer case when removed from your mouth. Pets, such as your dog or cat, are attracted to the bacteria on the retainers and may chew them apart. Small brothers or sisters may play with them and break them. Never bite down your retainers. They may break. Do not put the retainers in your pockets. Sitting on them will break them. When eating, do not wrap the retainers in napkins. They can easily be thrown away as garbage. If the retainers are not worn as instructed, your teeth will shift and your retainers will not fit. Never put the retainers in or on anything hot, for instance, boiling water, the top of the TV, or on the dashboard of your car in the sun. The heat will melt the plastic and the retainer will not fit. If you lose or break your retainer, of if they do not fit because they were not worn as instructed, there will be an additional fee to replace them. Clean your retainers with a very soft bristle toothbrush or Q-tip using clear liquid soap or dish detergent and cool water. You may soak your retainers in a cleanser such as “Retainer Brite” or any denture cleanser once a week. Please do not use toothpaste! Your retainers will be checked periodically during the first year your braces are off. After that, Dr. Baumwoll will check your retainers annually. Please bring your retainers to your retainer check-up. The retainers you have been given are removable. For the first two months, only remove them when eating, brushing your teeth, or playing an active sport or swimming. Otherwise, they must be in your mouth AT ALL TIMES! When the retainers are first inserted, you may talk differently and you may produce extra saliva because your brain thinks the retainers are food. Just be patient and wear them faithfully. Within a few days these problems will disappear. Since they can be easily lost or broken, your retainers must be in the retainer case when removed from your mouth. 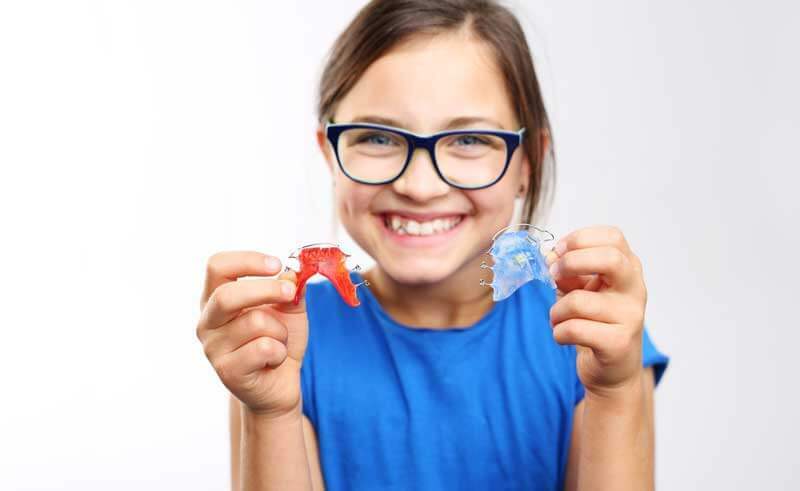 Unless Dr. Baumwoll gives you different instructions, you will be wearing your retainers all the time for six months, and then just at night while you are sleeping after that. Clean your retainers with a hard bristle toothbrush or nail brush using clear liquid soap or dish detergent and cool water. Be careful not to bend the wires while brushing. Toothpaste or mouthwash may be used to freshen the taste of your retainers but do not soak them in mouthwash. You may soak your retainers in a cleanser such as “Retainer Brite” or any denture cleanser once a week. The appliance(s) you have been given are removable. Only remove them when eating, brushing your teeth, or playing an active sport or swimming. Otherwise, they must be in your mouth AT ALL TIMES! When the retainers are first inserted, you may talk differently and you may produce extra saliva because your brain thinks the retainers are food. Just be patient and wear them faithfully. Within a few days these problems will disappear. Since they can be easily lost or broken, your retainers must be in the retainer case when removed from your mouth. Unless Dr. Baumwoll gives you different instructions, you will be wearing your retainers full time and turning the expansion screw every 4 days, by placing the small metal key in the expansion screw and turning it by following the direction of the arrow. If the appliance does not fit properly after you have been turning for some time, try turning the key backwards (in the direction opposite the arrow) and try to reset it. If this does not correct the problem, please call our office. Clean your retainers with a hard bristle toothbrush or nail brush, a clear liquid soap or dish detergent and cool water. Be careful not to bend the wires while brushing. Toothpaste or mouthwash may be used to freshen the taste of your appliances, but do not soak them in mouthwash. You may soak your retainers in a cleanser such as “Retainer Brite” or any denture cleanser once a week. Dr. Baumwoll will check your appliances periodically. Please bring your appliances to every visit. The appliance you have been given is cemented. When the space maintainer is first inserted, you may talk differently and you may produce extra saliva because your brain thinks the appliance is food. It also may be difficult to swallow at first. Just be patient and within a few days these problems will disappear. The space maintainer was placed so as to prevent any drifting of teeth and loss of space. If baby teeth were extracted or lost prematurely, it could be as long as a year or even more before the permanent tooth underneath it erupts. Remember, the baby tooth was taken out early so as to allow the permanent tooth to have adequate space for eruption. It is important to maintain impeccable oral hygiene. Brush at least twice a day. Do not forget to brush around the bands of the space maintainer. Avoid “playing” with the space maintainer with the tongue or fingers. Avoid gum or sticky candy. These may loosen or even break the appliance. The space maintainer will be checked at each of your 6-month checkup visits. Brushing and flossing your teeth can be challenging when wearing a space maintainer but it’s extremely important. If you cannot brush after every meal, rinse well with water. Special brushes such as a proxy brush can be used for hard to clean places. Try not to pick or play with your separator with your fingertips or tongue. If a separator comes out on its own, you do not need to call the office. If you chew something sticky and a separator comes out, please give the office a call so that we can replace.